I love this technique, and you don't need to speak Italian to get it. Thanks for posting this! So how do those tomatoes "keep" just hanging there?? and for how long? They have a thick skin on them. It's a variety call Peinnolo del Vesuvio. I believe it was Dar Jones who first brought seed to the US a couple of years ago. I have a few plants this year and this year I'm hoping to duplicate the preserving aspect of this little mater. A delicious and very quick meal that we have enjoyed repeatedly this year. Sometimes we enjoy it with a few enhancements just to add variety, such as onions, a few herbs, or panko sautéed with a touch of butter or olive oil and hint of garlic. Always with salt and fresh pepper at the end and maybe a sprinkling of cheese just before serving or a tiny dash of balsamic vinegar well mixed in. So much better than Ragu and a lot less trouble. 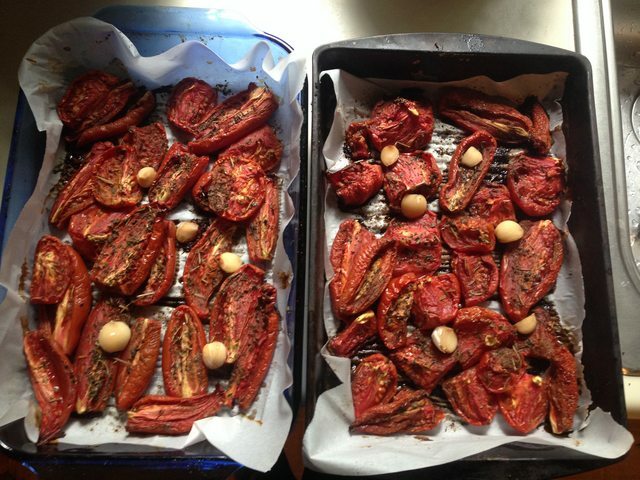 Light and delicious while a good way to use extra tomatoes...and not just San Marzano or Roma. The possibilities are numerous, like a bit of parsley or even peas. One night a bit of cinnamon, on another Mediterranean/Middle Eastern herbs and spices and even a touch of mint. We prefer the thin pastas. Please keep us posted on how these tomatoes keep and taste! Yes indeed, easy and super tasty. As Mensplace added, one can tweak it in many ways. I always use more garlic, combo of oil and butter, and for a super treat, use fresh pasta. Growing up one of my best friend's family taught me how to cook Italian...and make pasta and pasta sauces from scratch. This was a very traditional way, as in the video. However for larger quantities you need to adjust how you prepare it and not in a fry pan like this. Different fresh herbs, quantity of garlic, with or without meat or seafood, EVO alone or not, adding heavy cream or not...all sorts of variables to make different regional versions. Yummm...now I'm hungry. LOL Think I may have to make up some pasta for this evening. I`m just discovering this post(being new to the site). Just ordered Peinnolo del Vesuvio seeds from Heritage and should get them started this week. I`m especially interested in learning more of that way of preserving the tomatoes. No skin removal? I think I would find all those thick skins distracting, and would lift them out after the crushing step. Otherwise, looks delicious! Of course anything that contains tomatoes, EV olive oil, garlic, and basil is a multiple "O" by definition! I hung the Piennolos in my kitchen and most were beyond use in only 6 weeks, but I aim to keep trying. I'll try my cellar next year and maybe an outbuilding. Maybe pull the clusters a bit greener too. Hmmm, interesting...of course I've used fresh tomatoes in such a dish in the past, but these semi-dried-preserved looking ones look sort of like "fresh" sun-dried tomatoes, if you will. So the trick is to use that variety of tomato since they have thick skins, and to hang them to dry. Question is, where and how long? What if you put them in a dehydrator for a day or two, whole? JJJessee, if you don't have a dehydrator, how about a low temp oven? Just to dry them out somewhat, not cook them. Now I'm gonna have to think whether I should get some Peinolo de Vesuvio seeds. I have to start seeds soon and I'm still trying to edit my grow list. You guys are killing me. Hey,peebee. Drying is not really a critical point in this technique. You can use a fresh sauce-type no problem. I've used non-sauce type but cooking time suffers. I'm still working on get the Piennola to hang as long as it should. My garden does not yield many perfect fruit due to bugs. Next year I will try a cooler stop to hang in too. The low temp oven does make an excellent sauce though. I do 4-6 hours @ 275° with herbs, whole garlic cloves and EVOO on halved fruit. And pretty good eating straight out of the pan. JJJ, are those gorgeous toms in your pic the Piennolos? If so, will they(cooked this way) also mash up as well as the ones in the video, if you've tried the same recipe? I bet the thick skins of Piennolos end up not being a problem, texture-wise, as the thinner skinned tomatoes. I hate the curled up thin skins when I cook fresh toms in my soups and sauces, and pick them out. I've read somewhere that you need a dry, airy place that stays between 45 and 60 degrees. Your kitchen was probably too warm. Maybe check the temp in your cellar to see if it's a possibility for next year. I've been wanting to try this, but I don't have any place that meets the required temp range. Most of these folks just hang the clusters out on a covered patio to dry. In the house is not a good idea. Just about any small tomato will work.